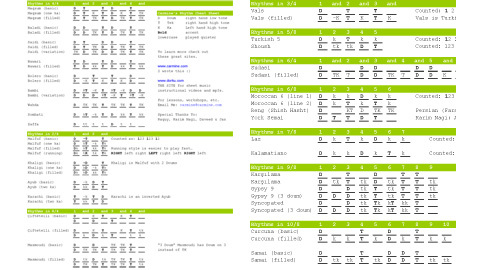 A whole bunch of Doumbek rhythms with Doum, Tek, Ka notation. Rhythms are in 4/4, 2/4, 8/4, 6/8, 7/8 and 9/8 10/8. Print this bad boy out and keep it handy in your doumbek bag.